It also celebrates 60 years of the iconic Caterham Seven track weapon. 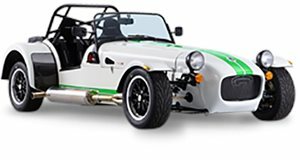 British carmaker Caterham has produced some of the most exhilarating lightweight track cars on the market. This year marks the 60th anniversary of the Seven, one of its best-known models, which also happens to coincide with the 40th anniversary of the Donnington Park race track. In joint celebration of the two British racing icons, trackday service BookaTrack.com has commissioned a limited-edition Caterham Seven that commemorates the iconic British circuit. Dubbed the Seven 420R Donington Edition, only 10 examples are being made, each named after a famous section of the track such as Redgate, the Craner Curves and the Old Hairpin. Finished in a striking blue livery with red and white stripes representing the Union Jack, the special edition Caterham Seven 420R Donington Edition packs a 2.0 liter Ford Duratec engine that produces 210 hp, and comes mated to a Sadev 6 speed sequential gearbox with a limited slip differential. It rides on 13-inch ZZR tires and has aero wishbone suspension and race dampers with unique spring rates. Customers can choose between either the standard S3 chassis or the larger SV chassis.